Of the total area, 1,000 hectares are protective and specialised forests, while 6,890 hectares are commercial forests and 4,669 hectares are alternative forests. Dak Lak is one of the localities having the largest area of concentrated forest area in this rainy season at 4,884 hectares. Regional localities have checked and reviewed the bold land area, especially the area illegally occupied, to plant trees. At the same time, the localities have also applied science-technology in forest planning, while preventing deforestation and illegal encroachment of forest and reclaiming occupied area for forest development. 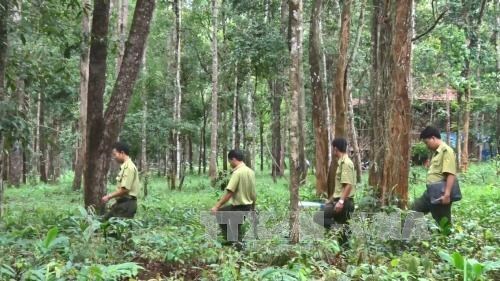 In Dak Lak, various economic sectors are encouraged to involve in planting protective forest with alternate industrial trees. They are also allowed to use forest for eco-tourism. Enterprises are called to expand production forest areas for building concentrated material areas with high and stable productivity and quality, thus contributing to the province’s GDP growth, creating jobs for locals and protecting the ecosystem. According to the Steering Committee for the Central Highlands Region, the regional localities have faced difficulties in capital for forest planting. Currently, the Central Highlands region, which comprises five provinces of Dak Lak, Dak Nong, Lam Dong, Gia Lai and Kon Tum, has over 2,513 million hectares of forest, including 2,234 million hectares of natural forest, with forest coverage ratio reaching 46.01 percent. Regional localities are speeding up forest planting towards a target of 49.8 percent in forest coverage in 2020.